In June 1987, archaeologist Zhang Zhongpei became the director of the Palace Museum, the former Forbidden City that once housed China’s emperors. His main ambition he expected to fulfill during his term was to retrieve all the cultural relics that had been sent to other parts of China during the periods of political turmoil from the mid-1930s to the mid-1970s. 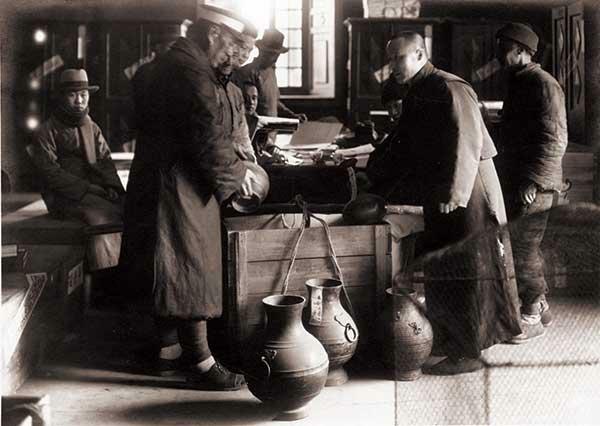 After the initial incursions in 1931 that would lead to the Second Sino-Japanese War, over a million pieces of cultural relics belonging to the Palace Museum were secretly transported from Beiping (then the name for Beijing, when it was not the capital, “jing” means “capital”) to southern China for safekeeping. After defeating Japan, China was immediately plunged into civil war. Some of the treasures were taken to Taiwan by the Kuomintang government following the civil war, and are now kept at the National Palace Museum in Taiwan. Of those remaining on the Chinese mainland, most were taken back to the Palace Museum in Beijing. While another significant portion of relics, a total of 2,211 boxes containing china, statues, and paintings were not returned to Beijing, but have been kept in Nanjing until the present. In order to save one of the world’s greatest collections from the invading Japanese army, the Palace Museum management made the decision to relocate selected pieces to safe places – temporarily. 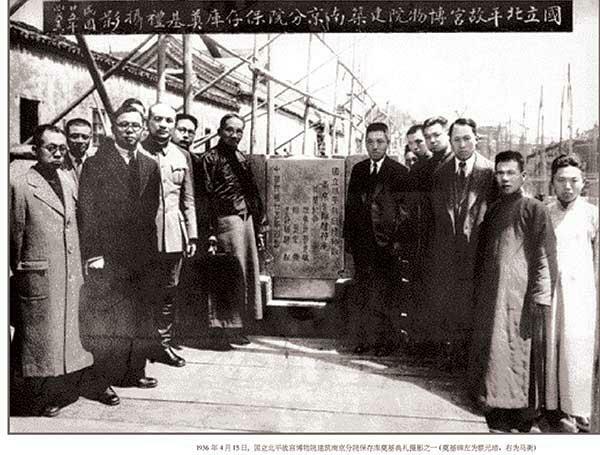 On the night of February 5, 1933, the whole city of Beiping was cordoned off as dozens of wooden carts set off from the Forbidden City to the city’s main train station. Soldiers stood guard along the silent roads that made up the route. On the carts, there were a total of 13,427 carefully wrapped boxes and 64 packages of cultural relics. By 1936, the whole contingent had eventually been sent to Nanjing and stored in the Chaotiangong warehouse. The Palace Museum also set up its Nanjing branch institute to administer the safekeeping of the treasure. With the chaos brought about by the war, over the following years, these items were sent in batches to different places across the country by train, cart, boat and car, including Huayan Cave in Guizhou, Emei and Leshan mountains in Sichuan, as well as Chongqing at different points, which was the Republican’s provisional capital during the conflict. In 1947, the items were finally sent back to Chaotiangong storehouse in Nanjing, a concrete three-story building along a basement, with an iron gate and small windows. At the end of 1948, the Kuomintang government, realizing its coming defeat to the Communists, started to send antiques from Nanjing to Taiwan. In three separate shipments, a total of 2,972 boxes of the items, accounting for over one fourth of everything being stored in Nanjing were transferred. Traveling together with the consignments were 15 employees from the Nanjing branch institute, none of whom ever returned to the Chinese mainland. Soon after the founding of the People’s Republic of China in October 1949, spy planes dispatched by the Taiwanese government would circle over Nanjing, Liang Jinsheng, the present director of the Cultural Relics Management Department at the Palace Museum, told NewsChina. Liang was just a toddler at the time. His parents were both staff employees at the Palace Museum’s Nanjing branch institute, and according to Liang, every time an airplane did a sweep of the city, he would follow others and rush for shelter in the storehouse basement. The sight of the storehouse windows protected by anti-blast equipment is still embedded deep in Liang’s memory. Soon after, in the 1950s, the majority of the items in storage were transported back to Beijing in three separate consignments. According to the official records released by the Palace Museum, a total of 11,178 boxes of artifacts were sent to Nanjing during the wartime. In 1950, 1,500 boxes were moved to Beijing, followed by 716 boxes in 1953 then 4,027 boxes in 1958, a total of 6,243. However, there are differing accounts on the issue of numbers. For example Ma Heng, a former director of the Palace Museum (1933-1952), once said a total of 8,308 boxes of artifacts were moved back to Beijing. Despite numbers disparity, various sources agree that 2,211 boxes were left behind in Nanjing. However due to the domestic social instability that resulted from various political campaigns of the late 1950s and the breakout of the decade-long Cultural Revolution in 1966, the Palace Museum could not fulfill its promise to return the remaining artifacts in the promised time frame. The storage house was later appointed as a facility by Jiangsu Province to Nanjing Museum. Once Zhang Zhongpei became the director of the Palace Museum in 1987, he started to speed up the negotiation process. Zhang tried to seek advice from the Supreme People’s Court and was informed that the first step was to seek administrative mediation by the higher level Ministry of Culture or the State Cultural Relics Bureau within the Ministry, and once that attempt failed, he could pursue the legal reclamation process. Zhang then went to the State Cultural Relics Bureau to seek help, while at the same time, appointed a legal firm in Beijing to provide legal consulting for the Palace Museum. Ma Zishu, deputy director for the Cultural Relics Bureau in 1989 explained to NewsChina in November: “The Culture Relics Bureau is in charge of all cultural relics within the country, which of course includes the issue of the remaining artifacts kept in Nanjing. The main principle is to ‘retain the original state’ of those artifacts and have them returned back to the Palace Museum. But the detailed process requires negotiations between the two sides.” Ma also added that considering the necessity of maintaining the complete collection of antiques, the Cultural Relics Bureau is on the side of the Palace Museum. “In particular, we hold the view that those [artifacts] directly linked to the history of the Palace Museum, should be in the Palace Museum for research purposes,” said Ma. During the interview, Ma also disclosed another similar case to the reporter. Luoyang Cultural Relics Bureau in Henan Province once borrowed Buddhist statues from a shrine in the Palace Museum for receiving the visit of King Sihanouk of Cambodia in the late 1970s. Despite the Palace Museum frequently notifying Luoyang to return the statues after the event, the city did not obey. “Thus if the case in Luoyang cannot be solved, how can you expect the similar case in Nanjing to be solved easily?” said Ma to NewsChina. In May 1988, the Palace Museum proposed a possible solution to Nanjing Museum, stating that the two sides should make joint efforts in opening those boxes, making an inventory of all the articles before the Palace Museum would make decision on reclaiming some indispensable artifacts. The first category are those artifacts bearing inseparable connections with the history of the Forbidden City, such as some 700 bronze Buddhist statues made during the Qianlong Emperor’s reign (1735 to 1796) in the Qing Dynasty. These statues were originally displayed in 700 niches in one of the worshiping halls inside the Forbidden City. The second category includes missing parts of artifacts kept in the Palace Museum, such as covers for artifact containers. The third category should include those artifacts that are particularly rare or the likes of which the Palace Museum does not have and therefore cannot put on display. Items not belonging to these three categories, could be divided between the two museums. The suggestion was denied by the Nanjing Museum, which claims that as the artifacts are property of the country, they can be kept at either museum, and that the Palace Museum leaving the items in Nanjing for such a long period is an indication of their negligence towards the artifacts. Meanwhile, Nanjing Museum has deep connections with the antiques after its preservation efforts over the years and decades. Negotiations continued back and forth between the two parties afterwards, but to no avail. In the mid-1990s, the Summer Palace in Beijing proposed a second plan. Ma Zishu, the deputy director of the State Cultural Relics Bureau went to Nanjing to mediate in the process of creating an inventory of the remaining artifacts. Nanjing Museum insisted it has the “property rights” to the artifacts and hoped the central government and Cultural Relics Bureau would listen to both sides’ opinions. Thus mediation efforts again were in vain and Ma Zishu admitted to NewsChina that the issue was a historically controversial case. In September 1997, China’s top officials, including then premier Li Peng, made personal visits to the Palace Museum and clarified principles for solving the pending issue. These were as follows: the Palace Museum has ownership of the remaining artifacts in Nanjing and that the Cultural Relics Bureau is responsible for the sorting, registering and making of an inventory of those artifacts; that it is not realistic to have all the artifacts sent back to the Palace Museum, but that those culturally indispensable ones should be returned as the first step and that most of the artifacts should remain in Nanjing and be preserved by Nanjing Museum. In November that year, the State Council released a notice addressing the issue of the remaining artifacts in Nanjing Museum, in accordance with the premier’s instructions. In May and August 1999, conferences between representatives from Beijing and Nanjing were organized by the Cultural Relics Bureau. The results of the two conferences led to the setting up of a joint team for the inventory work to follow. Qian Linxiang, the then deputy director of the general office of the Ministry of Culture was appointed as the deputy team leader for the inventory. Qian said during an interview with NewsChina: “After Reform and Opening Up, the former way of operating, via centralized instruction, gradually gave way to legal property rights, and thus it was not possible to simply order Nanjing to return the artifacts to the Palace Museum.” The suspension of the resolution of the issue would be harmful, according to Qian, to the general public. “It is more important to have those artifacts displayed to the general public as soon as possible,” added Qian. Despite the decision, Nanjing Museum declared new evidence in support of its claim to the property rights of the artifacts and presented this evidence to the State Council in June 2000. A new round of debate began soon afterwards. After 2000, negotiations between the two sides gradually faded away and any real inventory making has yet to begin. Zhang Zhongpei, though now 82, keeps very much abreast of any progress with the issue. He still has a photocopy of a newspaper page from Taiwan from the late 1980s. According to Taiwanese local media, the then director of the National Palace Museum in Taiwan, Qin Xiaoyi, expressed publicly that if the Chinese mainland and Taiwan could one day unify, those artifacts from Beijing that were transferred to Taiwan should be returned to the Palace Museum. “Once I saw this page and knew that even Mr Qin from Taiwan could realize the significance of the issue, I felt disheartened again that our counterparts in Nanjing, however, could not contribute to the process,” sighed Zhang Zhongpei.